When you think of technology, you probably think about those aspects of it with which you’re very familiar. Your smart phone and tablet might come to mind. You may picture your internet TV subscription and your flat screen TV. You might even rejoice over the fact that your digital camera lets you capture significant moments without leaving you fussing with film canisters. There is no doubt about the fact that technology has made its way into almost every aspect of our lives. For every piece of technology that we use, there are hundreds of which we’re not even aware. Technology can be used in surprising ways. Airports use digital displays to show when flights are arriving and departing. These screens tell you where to board your flight and whether it’s delayed or on time. Digital signage can also be used for marketing purposes. Nowadays, many billboards are digital. Instead of requiring people to climb up a ladder to hang an image onto the billboard, a digital billboard can be updated from one computer. 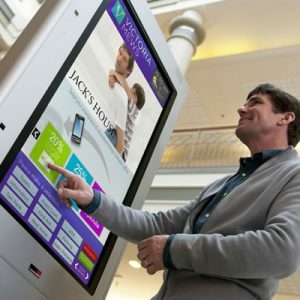 Digital signage in public places can advertise businesses that might be relevant to the people walking by. Even realtors can display their listings on a digital display in the windows of their offices. Instead of recording memories using printed photographs, scissors and glue, you can upload all of your photos to a digital scrapbook program and order a printed book. This saves valuable time and supplies. Plus, you can still get creative with different themes, colors, fonts and captions. You can use technology to find out more about anything. If you want to learn to draw, watch videos online. Learn how to play an instrument with digital technology that records you playing and provides feedback. You can even hone your singing voice with video games that rate your intonation. Instead of waiting among the germs in the doctor’s office, some doctors allow you to hold appointments via Skype. This saves everyone time and lets the doctor see you while you discuss your symptoms. In addition, you won’t pass along your illness or contract a new one while you’re waiting to see the doctor. There are several devices, apps and websites that can help you monitor your fitness levels. Some fitness trackers record your heart rate and the number of steps you take every day. You can sync them with an app on your mobile device to calculate the number of calories you burned and the distance you traveled. These devices range from basic to extremely inclusive. You can even receive text messages and use the GPS on some fitness trackers. If you’re interested in finding out more about the surprising ways in which technology can help you, you’ve come to the right place. We have information about the technology that you’re already using as well as wisdom about all the technology that’s out there waiting for you. There’s a lot to learn when it comes to technology. You don’t have to learn everything yourself. We’ve done the work for you so that we can provide you with clear, organized advice on the technology that could help make your life easier and better. Browse our website to learn about surprising and not-so-surprising ways that technology can help you.